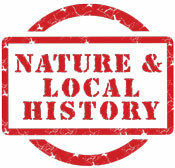 The tropical rainforest contains more biodiversity and more biomass than any other habitat on our planet. The amount of life in the forest is overwhelming. The rainforests of the southern Pacific coast of Costa Rica are home to many animals that are seldom observed by humans. We are going to have a brief look at 12 of these species. 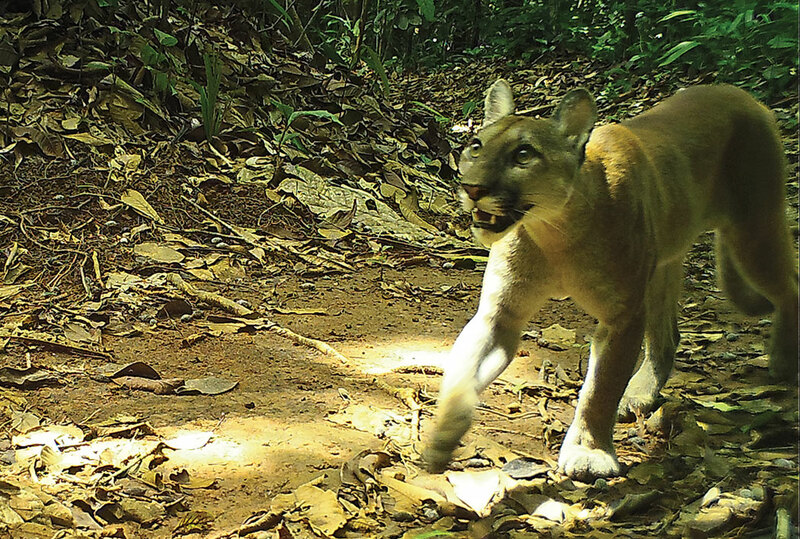 All of them have either been captured by trail cameras or seen on rare occasions by Hacienda Barú guests, guides, park rangers, and researchers. I first came to Hacienda Barú in February of 1972. During the 46 years from then until today I have never seen a puma, ocelot, margay cat, or false vampire bat, and have sighted each of the other 8 species less than 10 times. Puma (Puma concolor) The first sighting on Hacienda Barú was in the year 2010 by two of our guests. Since that time there have been about a half dozen sightings per year and many photos and videos taken by trail cameras. The fact that the ecosystem is robust enough to sustain a large predator speaks highly of the biological health of the region. This photo of a young puma was taken by a trail camera. Ocelot (Leopardus pardalis) – These are the second largest feline in the area, with mature adults weighing about 15 kg (33 pounds). I have never seen a live one in the wild, but my wife Diane has seen two during the time we have lived here. One of the workers at Hacienda Barú killed one in the early 1970s because it was eating his wife’s chickens. The sight of the dead body of the magnificent spotted cat affected me deeply, and set me on a path that led away from cattle ranching and toward the restoration and protection of natural habitat and the wildlife that it harbors. This photo was taken with a trail camera. 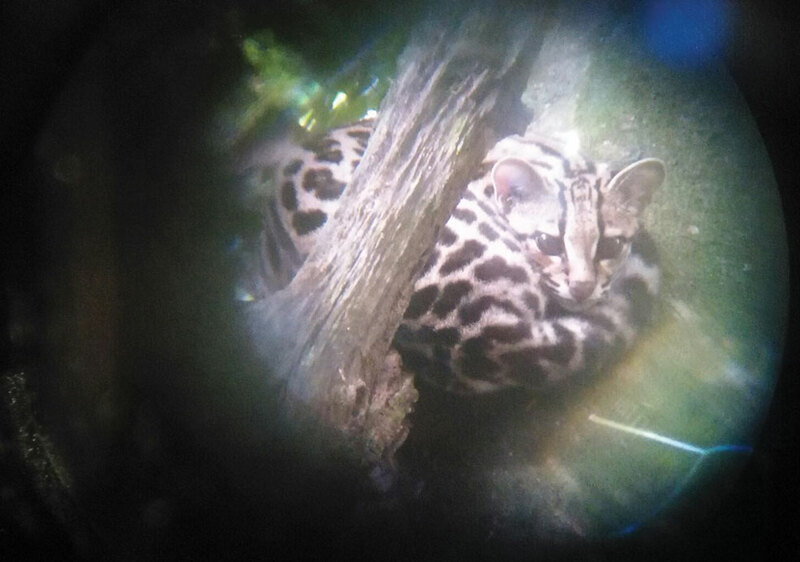 Margay Cat (Leopardus wiedii) – Hacienda Barú guide Deiber Segura sighted a margay cat in a tree and took this photo with his telephone through his spotting scope. 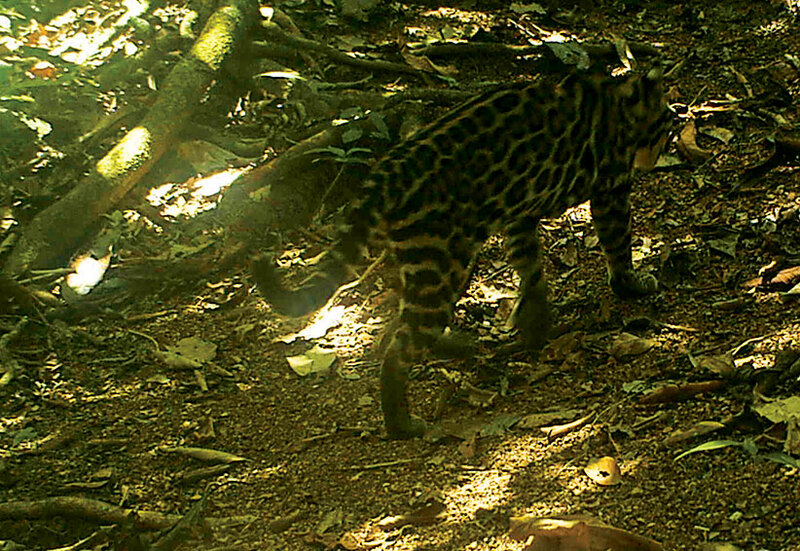 He and the guests he was guiding are only people to have definitely seen one of these elusive spotted felines on Hacienda Barú. They spend almost all of their time in the tree tops, and have never appeared on any of our trail cameras. 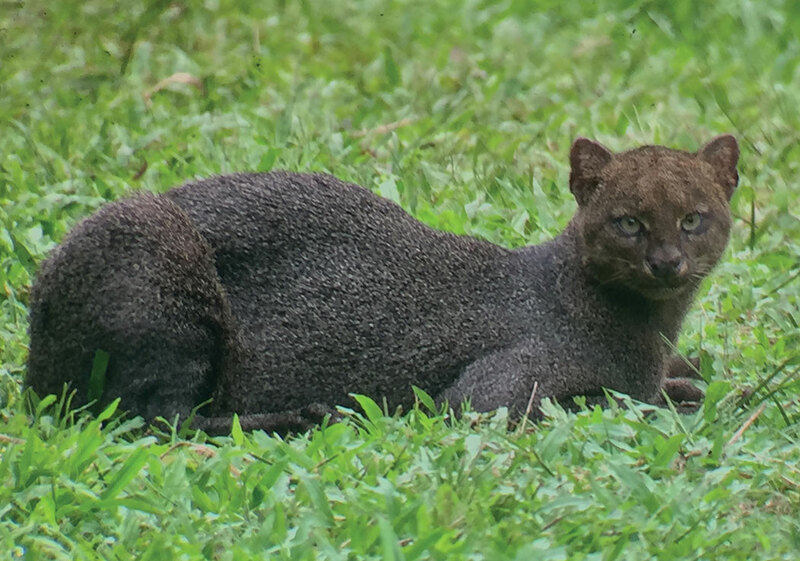 Jaguarundi (Puma yagouaroundi) – I may have seen as many as 10 of these beautiful black felines over the years. This photo was taken by guide Rigo Pereira while he and the guests he was guiding observed sleek feline sunning itself in a grassy patch near a wet land. Tayra (Eira barbara) – These feroucious looking members of the weasel family may reach an adult weight of up to 7 kg (15.4 pounds). They are notorious chicken killers. Usually they are sighted as a fast moving black animal dashing across a trail. I once had the good fortune to observe three of them exploring the crown of a huge rainforest tree for about 15 minutes before they detected my presence. 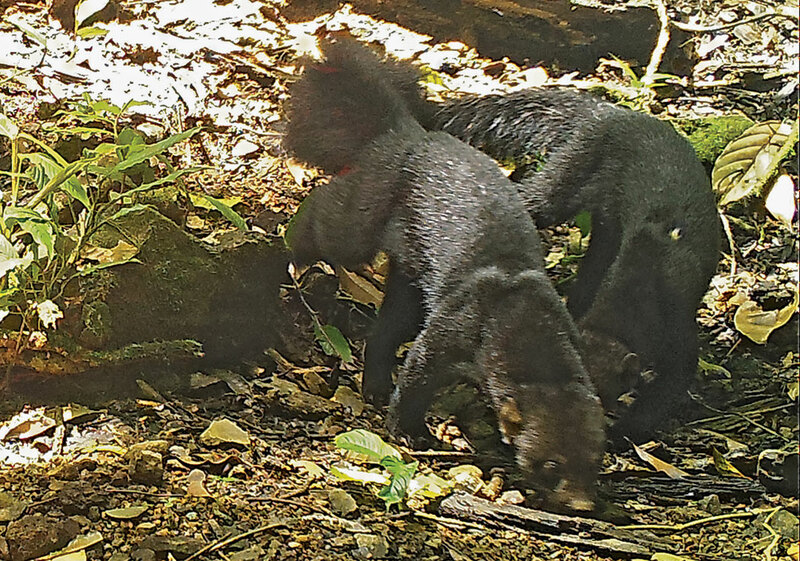 The photo of these two recently weaned siblings was taken by a trail camera. Grison (Galictis vittata) – I have seen only five grisons and have never been lucky enough to photograph one, even with a trail camera. This photo came from the internet. Guides and park rangers have seen about six over the years. One mature male used to live in a weed patch near the lodge and every morning at 6:00 am would come out of the weeds, sit in front of one of the cabins, and devour a rat that it had killed. 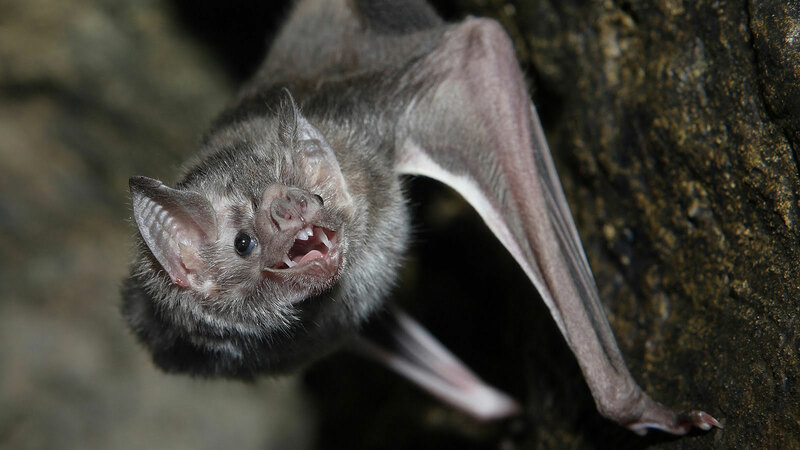 Vampire Bat (Desmondus rotundus) – So called vampire bats live on the blood of other mammals. In areas where large numbers of unnatural prey such as cattle and horses are found vampire bat populations increase far beyond natural levels. When this happens even humans may be preyed upon. I know of two cases of this happening. I have seen two vampire bats in my time at Hacienda Barú, both of which were captured in mist nets by biologists. One of those biologists took this photo. False vampire bat (Vampyrum spectrum) – This is the largest true bat in the world. (The flying foxes of southeast Asia are not true bats.) I have never seen one, but I know that we have them because many years ago a group of bat specialists captured one in a mist net at Hacienda Barú. They took this photo. Other bats form a significant part of its diet. 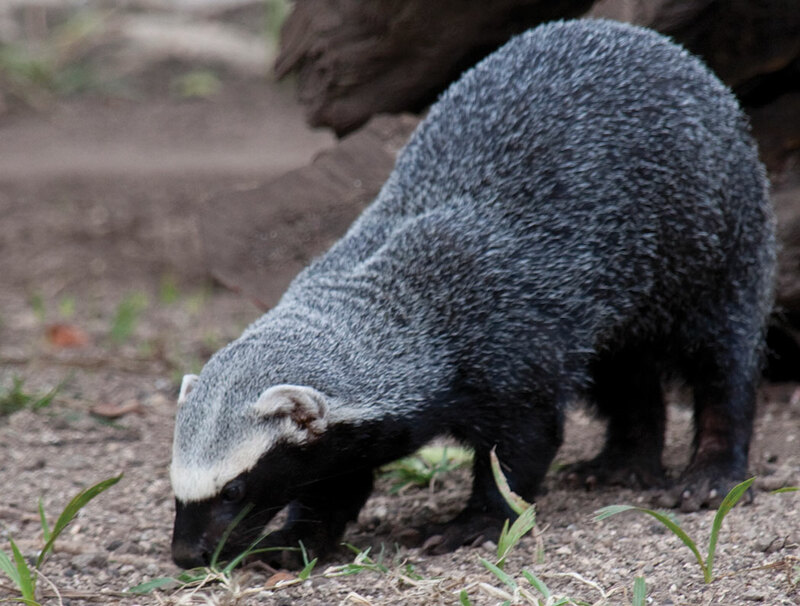 Tamandua (Tamandua mexicana) – I have seen about 10 of these anteaters, most of them at night. I took this photo of the only one I have seen at Hacienda Barú during the day. It was working hard to rip open a termite nest to eat the inhabitants. Unfortunately these beautiful animals are slow and awkward, and many are killed on the highways. 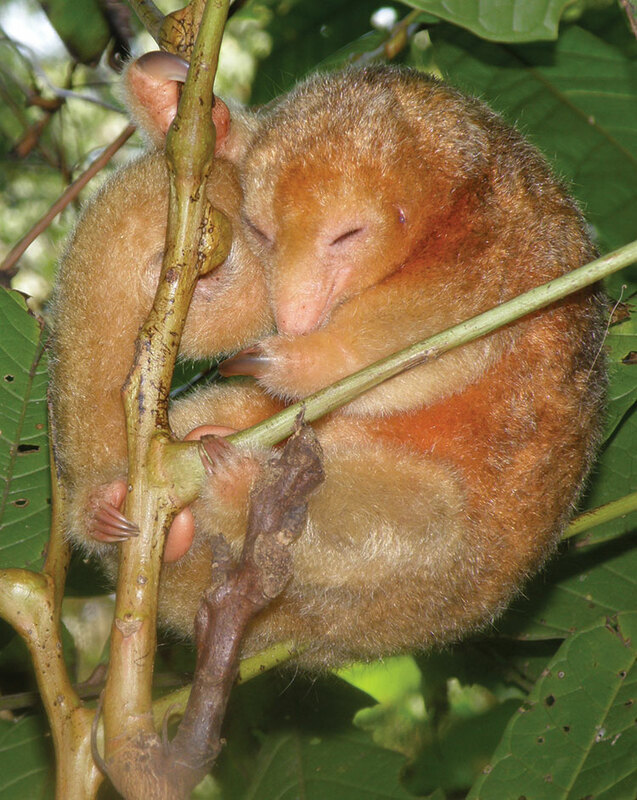 Silky Anteater (Cyclopes didactylus) – If you read my article in the January issue of Quepolandia you will know that I have only seen two of these small charismatic mammals. Most biologists believe that there are many more of them around than the rarity of sightings would suggest. They live secluded in the tree tops, and are very difficult to see. The one in this photo was observed by guide Olman Otoya and a group of Hacienda Barú guests. American Pygmy Kingfisher (Chloroceryle aenea) – Though I have only seen half a dozen of these charming little kingfishers many avid bird watchers have sighted them at Hacienda Barú. 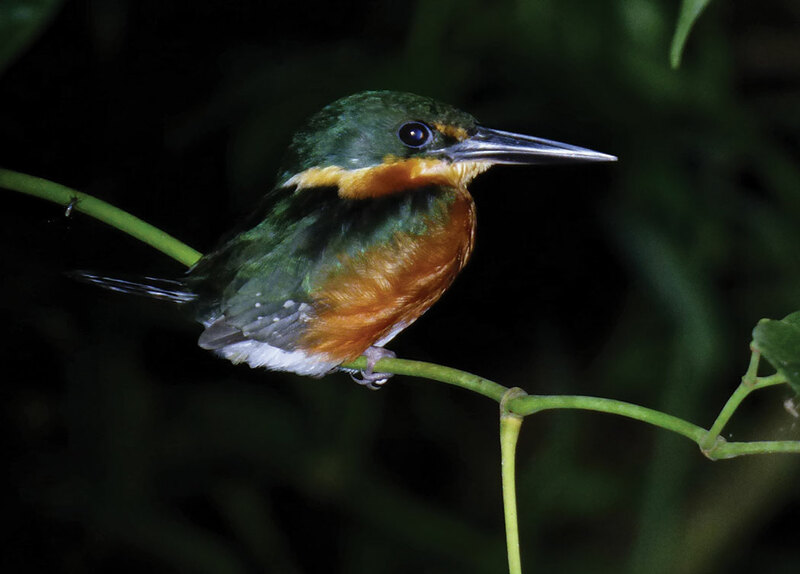 One of our trails is known for the frequent sightings of these fast moving little fishing birds. The photo was taken by guide Deiber Segura. 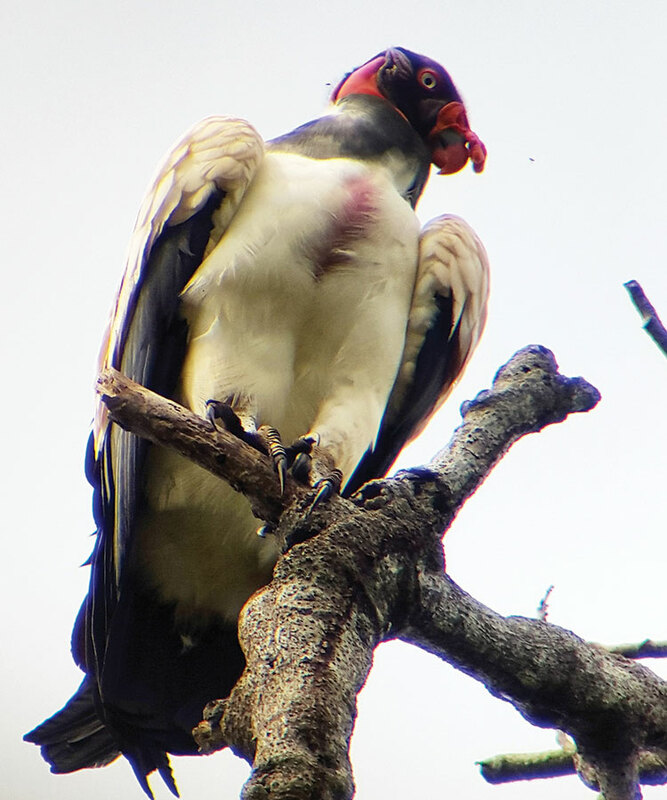 King Vulture (Sarcoramphus papa) – I have always thought that the king vulture with its regal appearance is aptly named. The king vulture detects the carcases of dead animals with its amazing sense of smell. 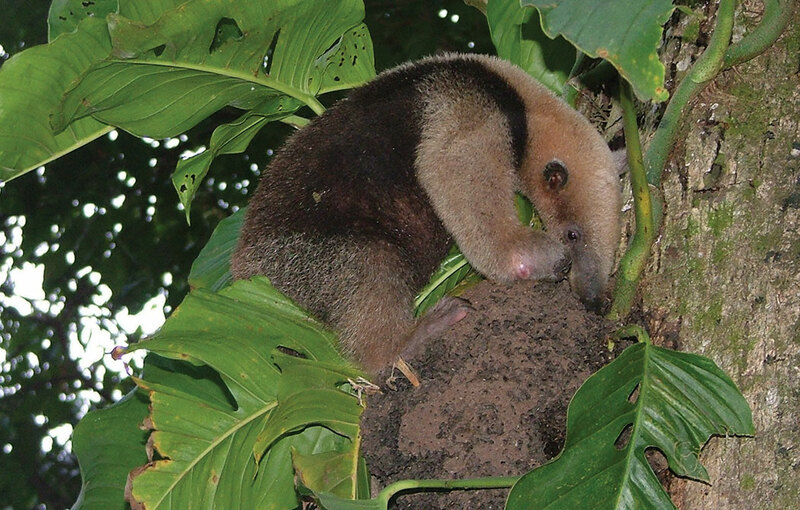 It is said that a researcher once buried a dead sloth in a rainforest in a plastic bag in a hole about 10 inches deep, and a king vulture found it. That is what I call an acute sense of smell. The photo was taken by Hacienda Barú guide Deiber Segura. I am sure that many of you readers have seen some of these species. And I’m equally sure that you will know why I consider myself fortunate to live in such a wonderful part of a wonderful country where wildlife like this are part of the natural environment, even if they are seldom seen.